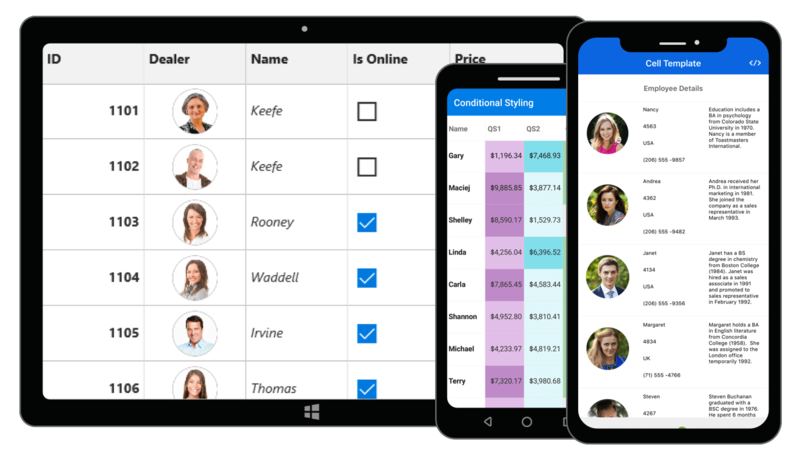 The Xamarin.Forms DataGrid control displays data in a tabular format with built-in support for editing, sorting, grouping, Excel & PDF export, swiping, pull-to-refresh and much more. The Xamarin.Forms DataGrid Control is a high-performance grid component that helps efficiently display and manipulate large amounts of data in a tabular format. Its rich feature set includes functionalities like data binding, sorting, grouping, editing, filtering, swiping, dragging, resizing, loading more items, pull to refresh, and more. It supports exporting the entire DataGrid or selected items to Excel and PDF file formats. It was built from the ground up to achieve the best possible performance on the Xamarin platform, even when loading large data sets. It has also been optimized to handle high-frequency real-time updates. The Xamarin.Forms DataGrid has data-binding support that works out-of-the-box for most popular data sources like, List and ObservableCollection. Further, the DataGrid control is completely MVVM compatible. It has built-in commands for handling interactions in MVVM. In-place, editing support with built-in column types provide the best editing experience. There are text, numeric, picker, and date picker editors with support to commit or roll back changes. Sorting - Sort the data using conventional sorting techniques against one or more columns either by touch or programmatically. Apply custom sorting logic to order data when conventional techniques do not meet the requirement. Summaries - Calculate and display sum, min, max, average, count, and custom aggregates for the entire DataGrid or individual groups to show the summarized information of all the data or just a section. Filtering - Easily filter and search records by setting a predicate to the view. Live streaming updates - Handle the high-frequency updates even under the most demanding scenarios in which data is sorted and grouped in real time. The summaries are calculated in an optimized way and the updated summary is displayed in real-time scenarios. Refresh the data source at runtime when performing pull-to-refresh action. Customize the pull-to-refresh view with sliding and pushing transition modes for a native pull to refresh experience. Conditional style - Customize cell and row appearances conditionally based on the data. Also, set any custom template to the cells or rows using template selectors. Users can customize the appearance based on the data conditionally. Swiping - Associate swipe buttons with custom actions. Swipe buttons are displayed by swiping from left-to-right or right-to-left over a data row. Create swipe templates and associate the views in them with custom actions. Drag-and-drop - Reorder rows and columns for additional end-user flexibility with column and row drag and drop. Resizing - Resize a column either on the move or on touch-up to read a lot of data with flexibility. Restrict a column with a minimum width to avoid hiding the column and a maximum width to restrict resizing beyond the limit. Selection - Select a row with four built-in selection modes: single, multiple, single deselect, and none. The single deselect mode clears a selected row when it is touched again. Apply animation to the selected row for the best selection experience. Keep track of the last row and interacted cell using the current cell. Use the keyboard to navigate through rows and cells for desktop platforms. Customize the selection background and foreground color, as well as the border color and border width for the current cell. Data virtualization - Create records on-demand by enabling data virtualization for the efficient processing of data. Load millions of data instantly with virtualization enabled. Paging - Manipulate the data using the DataPager control to view records in multiple pages. Customize visually appealing styles based on device and application requirements. Load data in the new pages on demand with options to maintain and reset the cache. Exporting to Excel - Export data in a Xamarin.Forms DataGrid to Excel file format with a variety of appearance customization options. Exclude specific columns, exclude headers, set custom row heights, set custom column widths, and much more. You can further customize the exported Excel file using the Syncfusion Xamarin Excel library. Exporting to PDF - Export data in a Xamarin.Forms DataGrid to PDF file format with a variety of appearance customization options. Exclude specific columns, exclude headers, set custom row heights, set custom column widths, and much more. A grid can also be exported to a specified page or position in a PDF document. Show or hide the column headers on each page of the exported PDF. Further, DataGrid provides a way to display additional content at the top (header) or bottom (footer) of the page while exporting to PDF. The exported PDF document can be viewed using the Syncfusion Xamarin PDF Viewer.